Raman spectra at an excitation wavelength of 532 nm were measured on graphene films transferred to GaAs substrates, with three levels of GaAs doping: p+, semi-insulating (SI), and n+. The graphene films were transferred from the host copper catalyst through a wet etching method that uses soft paraffin support. Single-layer graphene's characteristic G, 2D and D peaks were detected from two random locations on each GaAs substrate. With hole doping of the supporting GaAs, the G-peak shifts to higher wavenumbers and sharpens. The 2D peak also increases in intensity relative to the G-peak. While a simple charge transfer mechanism accounts for the G peak evolution with substrate doping, the 2D peak's increase with p-type substrate doping is peculiar and suggests further study of the graphene-semiconductor optoelectronics. This study presents a direct indication of charge transfer between GaAs and graphene from a purely optical probe that did not require electrostatic gating of graphene. B. Singidas, H. A. Husay, A. Somintac, E. Estacio, A. Salvador, and R. Sarmago. 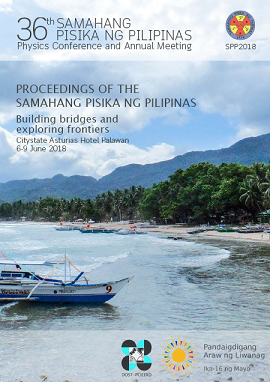 Charge transfer in graphene on GaAs probed by Raman spectroscopy, Proceedings of the Samahang Pisika ng Pilipinas 36, SPP-2018-3C-01 (2018). URL: https://paperview.spp-online.org/proceedings/article/view/SPP-2018-3C-01.